Tapping is a common manufacturing and fabricating operation. 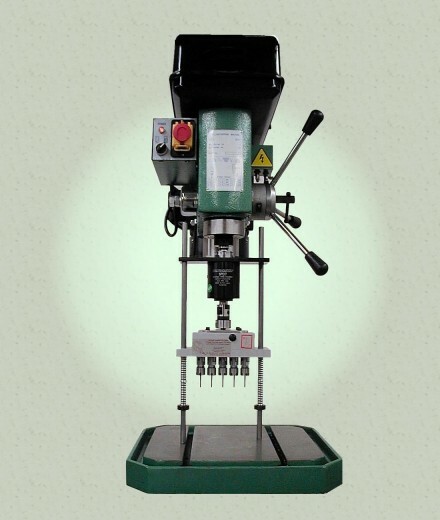 Drill presses are available in most industrial or manufacturing operations. AutoDrill has made tapping multiple holes using a drill press a productive process. A tapping head, guide columns and a multi-spindle head setup for tapping can improve slow multiple hole tapping operations. A standard, non-reversing drill press and our multiple tapping fixture can now tap more than one hole at a time. AutoDrill provides the knowledge to determine the correct components for a successful high production setup. The cost to retrofit a drill press for multi-hole tapping is paid back quickly. The quality of the finished product is also improved because of the precision repeatability of the process.